Today, I’m fascinated by the Canadian story of the Glo-Hill Corporation. The three Globus brothers (of Belgian origin), along with their brother-in-law Harry Hill, together became the Glo-Hill Corporation in Montreal in 1946. 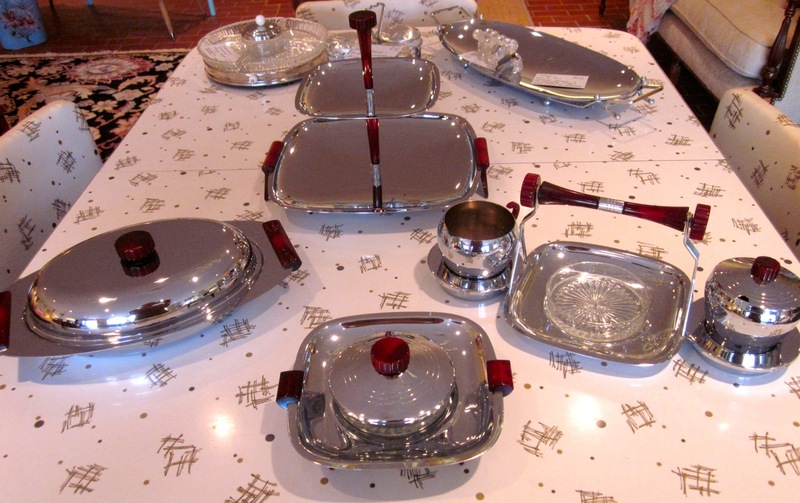 The Globus brothers originally made beautiful carving sets and cutlery but they became very well known for their exquisite designs of chrome holloware home entertaining pieces. They imported bakelite and glass from down the Eastern Seaboard to adorn their many serving pieces. The company ceased to exist in the 1970s. two-tiered server (SOLD), covered vegetable dish with divided glass insert SOLD).